The liver is one of the primary organs. It is also one of the most important as it performs more than 500 functions. For instance, the liver filters fats, amino acids and glucose from the blood. In addition, the liver eliminates toxins and drugs, and helps the body to fight infections. What is more, the liver acts as a mechanism to process digested food. The liver produces bile, stores vitamins and iron. It breaks down food before turning it into energy, regulates and produces hormones. The liver also produces enzymes and proteins that are useful to heal wounds and clot the blood. Due to its many functions, the liver’s condition impacts a person’s health. Fatty liver disease is one of the most commonly encountered diseases of the liver. This occurs when fat accumulates in the liver tissues. The liver will not function properly as there is an imbalance between the amount of fat synthesise from the blood and exported to the blood. Eating food high in refined carbohydrates and saturated fats will increase the risk. A diet high in carbohydrates and excessive sugar will cause the body to become resistant to the hormone insulin, resulting in increased insulin levels. When this happens, the body tells the liver to store more fat. Some anti-inflammatory drugs, analgesics, immuno-suppressants and cholesterol lowering drugs may cause liver damage. Meanwhile, drugs that may contribute to fatty liver include acetaminophen, amiodarone, synthetic oestrogens, and others. Drugs used in treating diabetes such as glitazone also may cause fatty liver. 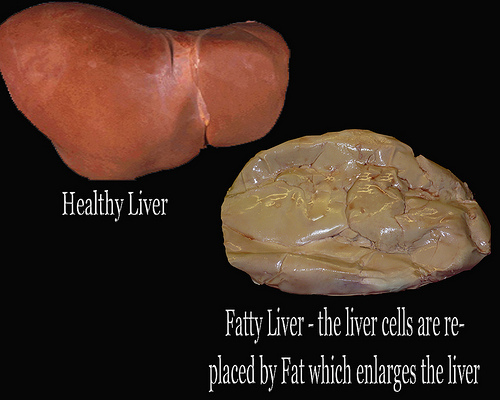 Consuming large amounts of alcohol, narcotics, and amphetamines also contributes to fatty liver. These substances will damage the liver when taken repeatedly in large amounts. Exposure to dyes, solvents, plastics, insecticides, pesticides, glues, cleaning fluids and industrial chemicals increases the risk. Each of these toxins can cause severe liver damage when a person is exposed to any of them for a long period. The risk of developing fatty liver disease is high when a person comes from a family with a history of diabetes. Persons who are obese and suffer from diabetes also will have a high risk of developing fatty liver. Many people are unaware they have fatty liver disease, especially in the early stage. This is due to its vague symptoms as they are non-specific and mimic other conditions. However, fatty liver sufferers often feel unwell, fatigued, moody and irritable, and have unexplained weight gain. As the disease progresses, sufferers develop poor memory and are not able to keep up with their daily activities. Furthermore, for some overweight people, they may experience sleep apnea. Fatty liver sufferers should avoid foods high in sugar and corn syrup. Instead of processed foods, they need to eat raw vegetables and fruits. These natural foods help to cleanse and repair the liver. Eating salad, with cold pressed oils and apple cider vinegar or lemon juice, helps to overcome weight problems. Furthermore, eating good quality proteins such as beans, lentils, chickpeas, raw nuts and seeds reduces the craving for carbohydrates. Protein also reduces mood swings and irritability. Instead of consuming dehydrating fluids like alcohol, soft drinks, diet drinks and coffee, fatty liver sufferers need to drink water, vegetable juices and herbal teas. Keeping the body well hydrated helps the liver and kidneys to operate efficiently. Hydrating fluids also increases the body’s alkalinity to improve detoxification and keep the body healthy. Regular exercise increases the body’s metabolism and reduces insulin levels. By incorporating exercises, such as walking, swimming or other recreational sports, sufferers can stay active. They will have more energy as their liver function is improved. Fatty liver disease is reversible if sufferers eat a healthy diet; drink plenty of hydrating fluids and exercise frequently. In order to prevent fatty liver disease, people should also avoid exposure to environmental toxins. A healthy liver prevents the body from infections and keeps the mind sharp. A person with a healthy liver will have a full life, be confident and have plenty of energy.